Athens-Clarke County Engineer Administrator Jerry Oberholtzer said his office discovered settling and breaks in the eastbound sections of Orkin Drive and buckled sidewalks only a month or so ago. Oconee County assumed responsibility for its part of Dozer Drive on Sept. 3, and Athens-Clarke accepted Orkin Drive and that part of Dozer Drive under its jurisdiction on Aug. 6. The two governments built the roadways as part of the deal to lure Caterpillar to the area. They agreed to split costs of the project evenly. Although Oconee County Attorney Daniel Haygood referenced County Public Works Director Emil Beshara at the BOC meeting on Aug. 27 when he said “all standards have been met” for Dozer Drive, Beshara told me in an email message last Thursday that he was not involved in inspections of the roadways. Oberholtzer confirmed in a telephone conversation yesterday that the Department of Transportation and Public Works of Athens-Clarke County conducted inspections while the roadways were being constructed and afterwards. “They passed all of our inspections,” he said. Borings taken during construction missed what is now known to be the problem, Oberholtzer said. Old asphalt and even tree stumps and branches are buried six to eight feet beneath the surface, he said, and in some spots the pit contains six to eight feet of the debris. Oberholtzer said he is guessing the materials were put into the pit when U.S. 78 was rebuilt as a four-lane road. Orkin Drive runs on a narrow strip of land owned by the industrial development authorities of the two counties and serves as the primary entranceway to the Caterpillar plant from U.S. 78. The problem with the roadway is just west of the intersection of Orkin Drive and U.S. 78. 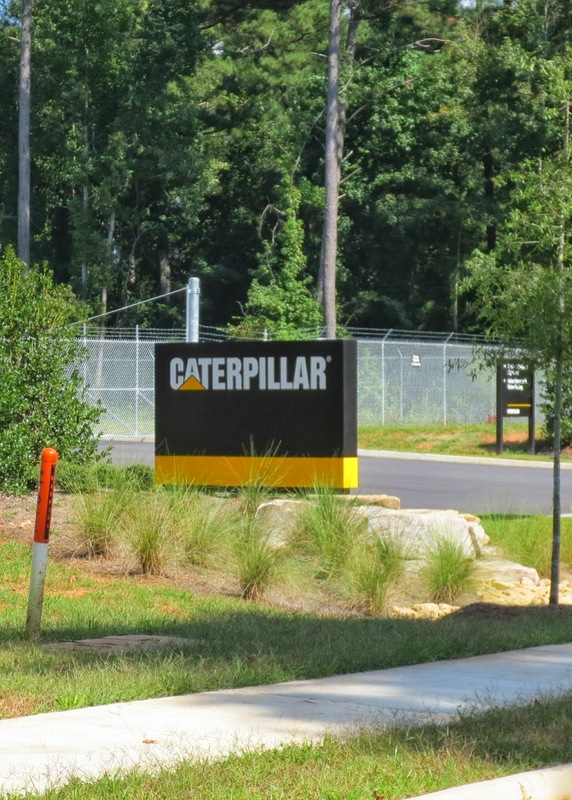 Dozer Drive runs from Atlanta Highway along the eastern border of the Caterpiller facility, which is owned by the development authorities and is leased to Caterpillar as part of the tax abatement program for the company. The plant borders the city line of Bogart. Caterpillar has scheduled its grand opening and ribbon cutting celebration from 10 a.m. to 12:30 p.m. on Oct. 31. The event should not be affected by the problems with the roadway. To repair the road, crews from Athens-Clarke County will have to remove materials from the buried pit and replace those materials with soil from another site. Oberholtzer said he is looking for suitable replacement soil at present. The two governments probably will contract for the actual paving, he said. During the two weeks of construction, Oberholtzer said, traffic will be shifted from one side of the road to the other so the roadway can remain open.